John Ryan is the President and Managing Partner of Hall Render. From 2005-2011, he served as the Human Resources Chairman and Hiring Partner for the firm. While today he serves in a management role, he still practices employment law and focuses on counseling hospitals, health systems and physician practices. From time to time, he is involved in high-profile investigations into complaints and compliance issues on behalf of clients. 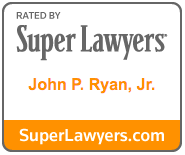 John’s perspective as both a business leader and practicing attorney provides clients with a higher level of counsel that is uniquely helpful and practical, particularly as it relates to reductions in force as well as executive-level and physician personnel matters. John was appointed to the EMS Commission for the State of Indiana by Governor Eric Holcomb in 2018. He is also a member of the Young Presidents' Organization – Indiana Chapter. As a father of four, John and his wife are often busy with their children’s activities. In what free time he does have, he enjoys cycling, running, fishing and reading.